I know how it is. You want to mail order that special bottle of sauce or jar of rub but think about how the cost of shipping makes it prohibitively expensive. Chef Wayne of Tropical Island Gourmet also understands that which is why he is making this special offer through February 24th, 2011. 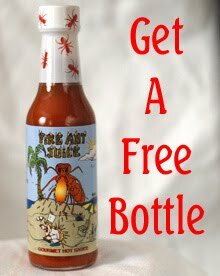 For orders placed between now and then, Tropical Island Gourmet will include a FREE BOTTLE OF FIRE ANT JUICE, the 2010 SCOVIE Award winning hot sauce. Just include the word NIBBLE ME THIS in the comments section for your free bottle. That will make up for the shipping costs. I also order several bottles at a time in order to lower the overall per bottle costs once shipping is added in. [Standard Disclaimer] I pay full price & shipping for the products I buy from Tropical Island Gourmet and have no affiliation with them other than enjoying Chef Wayne's products. I receive no compensation for this post although they do throw in a freebie sample here and there when I place an order of several jars.